As the candidate filing period comes to an end and 2018 election campaigns begin in earnest, the NC House maps in Wake and Mecklenburg counties are still being contested in court for yet another election cycle. Read on for a quick summary of the twists and turns in the legal case, what the NC House maps are likely to look like for 2018, and what this means for Democrats’ chances to break the supermajority or, better yet, to take back the NC House altogether in 2018. 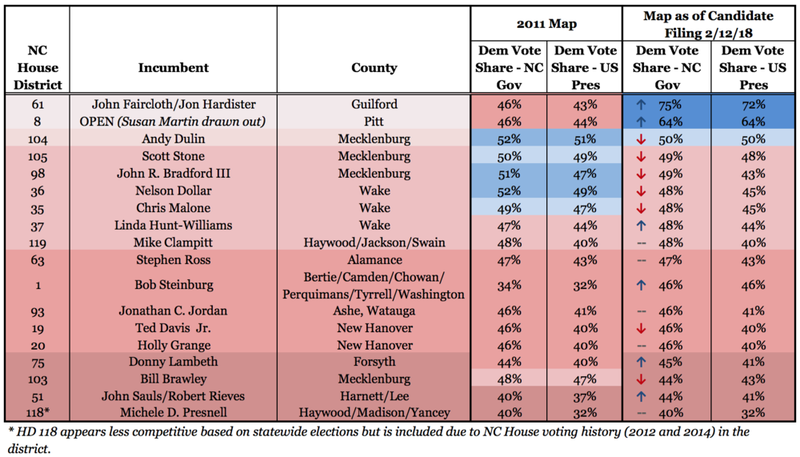 For an updated version of our complete analysis of the most flippable districts in the NC House, click here. For our companion guide to the NC Senate, click here. Following a Federal Court order to correct the blatant racial gerrymandering in the existing legislative maps, the NC GOP submitted new maps in August 2017. The Federal Court subsequently rejected portions of these maps, including (i) districts that failed to fully remedy the racial gerrymandering and (ii) districts in Wake and Mecklenburg counties that were unaffected by racial gerrymandering but had been illegally re-drawn by the GOP – in violation of the state constitution – purely for partisan advantage. The Court ordered a Special Master to fix these remaining problems and accepted his maps as final in January 2018. But on February 6th, the US Supreme Court issued a partial stay of the Federal Court ruling, reinstating (for now) the GOP's proposed maps for Wake and Mecklenburg counties. While final rulings in the NC and US Supreme Courts are yet to come, given that the short candidate filing period ended on February 28th, it looks like the 2018 election is likely to be conducted using the GOP's proposed maps for Wake and Mecklenburg counties. So what do these changes mean for Democrats’ chances to break the supermajority and flip the NC House? Not surprisingly, the competitive districts in Wake and Mecklenburg counties are generally more favorable for Republicans under their own maps. In Mecklenburg County, the changes are relatively modest, with NC-H104 becoming less than 1 point more favorable for Republicans, NC-H103 becoming 1 point more favorable, and NC-H105 becoming 2 points more favorable for Republicans (as measured by the results in the Governor’s race in 2016). The changes are more substantial in Wake County. For the three districts currently held by GOP incumbents, NC-H35 becomes 2 points more favorable for Republicans and NC-H36 8 points more favorable for Republicans under the GOP maps, while NC-H37 becomes 1 point more favorable for Democrats, in large part because the GOP moved some of its Republican-leaning precincts to NC-H36. The Republicans were also able to make the most competitive district currently held by a Democrat, NC-H40, 7 points more favorable for the GOP. While these changes are clearly slanted toward the NC GOP, they don’t have a major effect on the kind of Democratic wave that it will take to break the supermajority or the majority in the NCGA. Democrats only need to pick up 4 seats to break the supermajority, and under the new maps, there are two easy pickups for Democrats: NC-H61 in Guilford County (D+52) and NC-H8 in Pitt County (D+30). With these seats, Democrats only need to win two of the six most competitive districts in Wake (35, 36, 37) and Mecklenburg (98, 104, 105) counties, all of which Governor Cooper lost by just 1-2 points under the GOP maps. These districts are trending Democratic and are all among the most flippable districts in the state for 2018. To break the majority in the NC House, the Democrats need more like a 7-to-8 point wave statewide (relative to Governor Cooper’s performance in 2016). And NC-H103 in Mecklenburg County remains one of the kinds of places Democrats need to win in order to pick up the 15 or more seats needed take back the NC House. So, while the Supreme Court stay certainly isn’t good news, it doesn’t alter the fundamental dynamics of the 2018 elections. We continue to have an excellent chance to break the supermajority and – with a big enough Democratic wave – could take back the NC House altogether. The best news of all? Ultimately the size of that wave is up to us. Every door we knock, every volunteer we recruit, and every voter we connect with from now until the election helps to build the wave that much bigger. Election Day is less than 8 months away. We have a great chance to take back our state and restore true democracy. Join us, and let’s get to work! Stay tuned! Updated interactive maps coming soon!